The Book of Beasts: Monsters of the Shadow Plane describes the deadly and frightening monsters that go bump in the night. 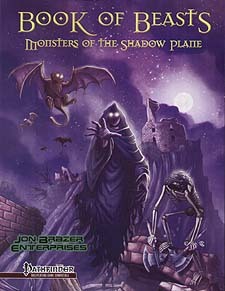 Over 50 new fierce and fantastic denizens of the Shadow Plane loom ready - long-forgotten and twisted creatures, hordes of tormented undead, legendary monstrosities, and more wicked foes. These monsters will challenge adventuring parties in new and exciting ways - whether they dare the Shadow Plane or encounter them in your setting. Bring a new plane of peril to your adventures. This monster book is the latest in the award-winning Book of Beasts series. It is the core bestiary to Jon Brazer Enterprises' Shadowfall series for the Pathfinder Role Playing Game and your adventures on the Plane of Shadows.